The Columbus Crew are getting busy. A bunch of games in a short period of time means we get to see who is made of what and lots of different lineups. 1. O'Rourke and Grossman have started together only once. Against Seattle (away) and it was one of, if not THE, biggest wins in the past two seasons. 3. Team Goals For while starting in their last Five games. Keep in mind that there aren't any out of control goal scoring points on this years Crew team. You might think this is where Milovan would thrive... but not the case (whether due to injury, form or otherwise). 4. Danny and Cole are best in Goals Against, as well. This is the area of supreme strength for Columbus, so all do well here. 5. One important thing to note here, and it benefits everyone: Ever since Robert Warzycha changed the lineup and include two Defensive Mids, injuries have gotten less frequent. The Crew have had to change their primary lineup from a 4-1-3-2 (diamond midfield) to a 4-2-3-1 because they are without productivity out of any target men this year. Aaron Schoenfeld and Olman Vargas haven't quite adapted (through no real fault of their own) and Tommy Heinemann is injured (through no fault of his own, either). This change in formation has reduced the amount of running a Central Defensive Midfielder had to do in Warzycha's system. Frankly, it was too much running with near impossible responsibilities. In the old lineup the CDM position was a front row ticket to the infirmary. 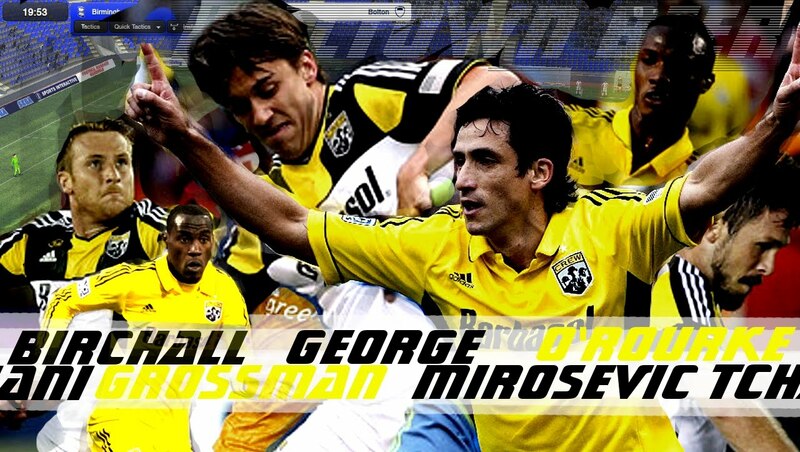 Think: Rich Balchan, Danny O'Rourke, the late Kirk Urso and Milovan Mirosevic. It's a good formation and should work well enough in this league. It even seams as if the diamond midfield formation has moved to third choice as well. I've seen the team run varient on a 4-3-3 (4-2-1-3) in reserve games and late in a couple Senior level games. It looked positive from what I saw and Ben Speas seemed to do well playing behind a top line of Schoenfeld, Vargas and Renteria. It may be something the Crew pull out if they get desparate during the playoff push. Anyhow. Give O'Rourke and Grossman another run out together. I'd bet a shinny silver dollar on a 2-0 victory against Toronto. • As a club, they haven't scored more than two goals in any games and only allowed more than 2 once. So, no outliers in last 5 games for each player. • A crowded schedule should be healthy for the club. They have been last in games played because of the wacky MLS schedule this year. For the rest of the world two games a week is part of the modern game but in Major League Soccer it is a bit of anomaly for most clubs. Games every 2 or three days will be just what the doctor ordered. • Not entirely fair to pull Mirosevic into this Defensive Mid group as he has spent a lot of time more as a Central Mid (neither up or back). However, I do feel that his tendency to drift back was a driver for Warzycha's formation change.